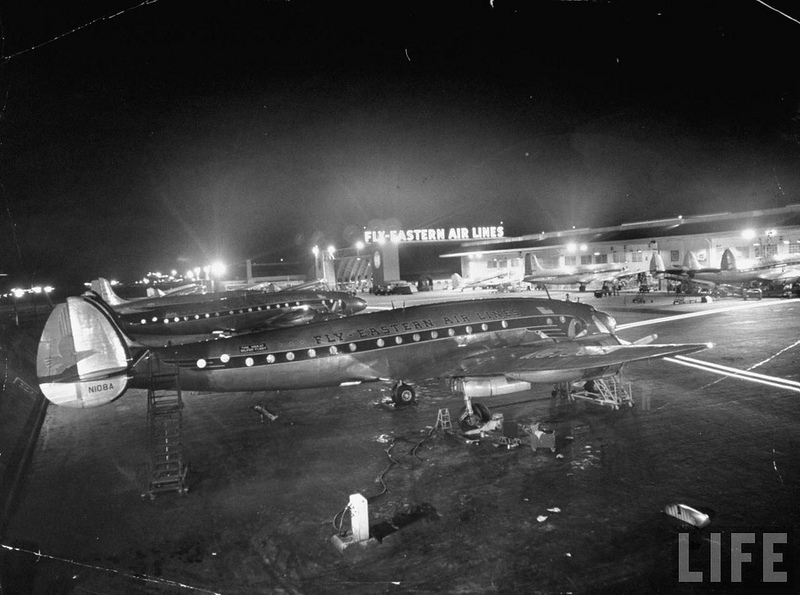 5 February 1949: An Eastern Air Lines Lockheed L-749A Constellation, serial number 2610, N115A, flew from Los Angeles to LaGuardia Airport, New York, in 6 hours, 17 minutes, 39-2/5 seconds, setting a new West-to-East transcontinental speed record for transport aircraft. Captain Fred E. Davis was in command, with First Officer M.L. Jordan and Flight Engineer E. L. Graham, Eastern’s Chief Flight Engineer. The flight was timed by officials of the National Aeronautic Association. The Constellation took off from Lockheed Air Terminal at Burbank, California, at 7:51:21 a.m., Pacific Standard Time (15:51:21 UTC), and passed over La Guardia at 5:08:02 p.m., Eastern Standard Time (22:08:02 UTC). 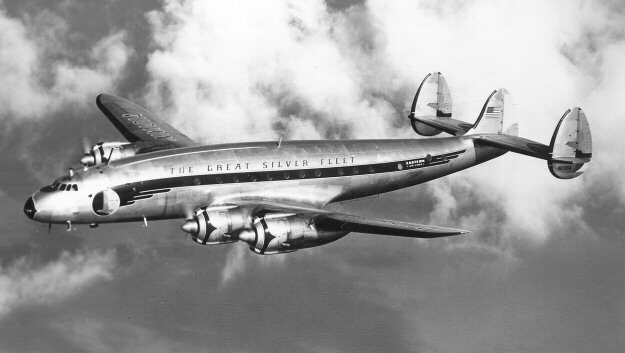 The Constellation averaged 392 miles per hour over the 2,455 mile flight. 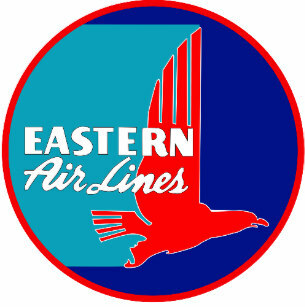 The following day, 6 February, Eddie Rickenbacker, Eastern Air Lines’ president and general manager, announced that that the company had ordered an additional seven Lockheed Constellations at a cost of more that $1,000,000 each, with the first one to be delivered to Miami, Florida, the following week. The Lockheed L-749A Constellation was a longer-range development of the L-649, with fuel capacity increased by 1,130 gallons (4,278 liters). It was operated by a flight crew of four, with two to four flight attendants. It could carry up to 81 passengers. The airplane was 97 feet, 4 inches (29.667 meters) long with a wingspan of 123 feet (37.49 meters) and an overall height of 22 feet, 5 inches (6.833 meters). It had an empty weight of 56,590 pounds (25,668 kilograms) and maximum takeoff weight of 107,000 pounds (48,534.4 kilograms). 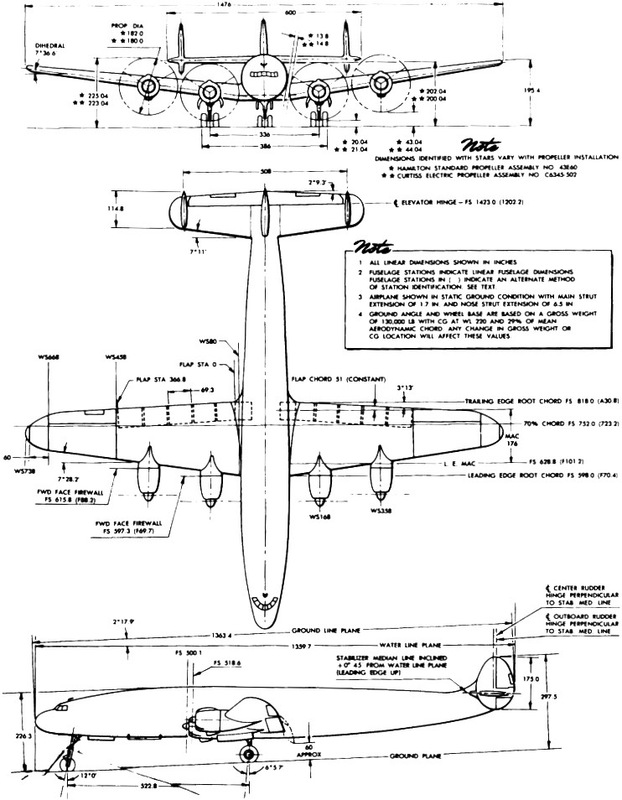 Three view illustration of the Lockheed L-749 Constellation. The L-749A was powered by four 3,347.662-cubic-inch-displacement (54.858 liter) air-cooled, supercharged, fuel-injected, Wright Aeronautical Division Cyclone 18 745C18BD1 (R-3350-75), two-row 18-cylinder radial engines with a compression ratio of 6.5:1. This engine, also known as the Duplex-Cyclone, featured “jet stacks” which converted the piston engines’ exhaust to usable jet thrust, adding about 15 miles per hour (24 kilometers per hour) to the airplane’s speed. They had a normal power rating of 2,100 horsepower at 2,400 r.p.m., and 2,500 horsepower at 2,800 r.p.m. for takeoff, (five minute limit). The engines drove 15 foot, 2 inch (4.623 meter) diameter, three-bladed Hamilton Standard Hydromatic 43E60 constant-speed propellers through a 0.4375:1 gear reduction. The 745C18BD1 was 6 feet, 6.52 inches (1.994 meters) long, 4 feet, 7.62 inches (1.413 meters) in diameter and weighed 2,915 pounds (1,322 kilograms). The L-749 had a cruise speed of 345 miles per hour (555.22 kilometers per hour) and a range of 4,995 miles (8,038.7 kilometers). Its service ceiling was 24,100 feet (7,346 meters). N115A was leased to California Hawaiian Airlines, 1961–1962. It was purchased by Rutas Internacionales Peruanas SA (RIPSA) in 1966 and re-registered OB-R-833. In 1968 it was withdrawn from service and was scrapped in 1981. Photographs of the derelict record-setting airplane parked at Lima, Peru, in 1980, are just to sad to publish here. Mont Blanc, western face. The summit was most recently measured at 4,810.06 meters (15,781.04 feet). 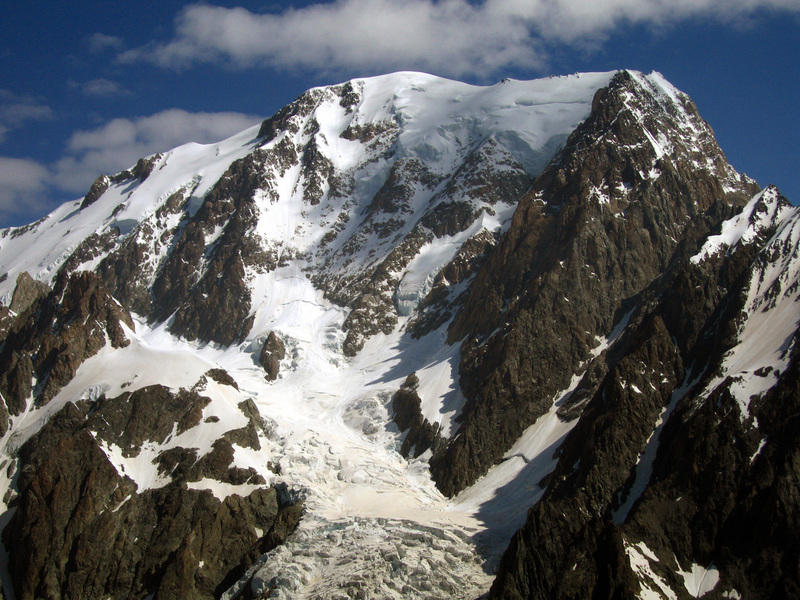 18 meters (59 feet) of snow and ice cover the actual rock peak, at 4,792 meters. 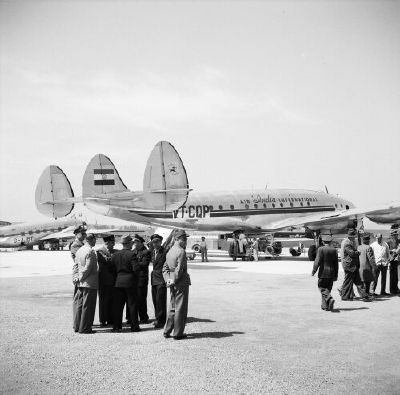 3 November 1950: Air India Flight 245, a Lockheed L-749A Constellation, VT-CQP, Malabar Princess, was on a flight from Bombay, India, to London, England, with intermediate stops at Cairo, Egypt and Geneva, Switzerland. The aircraft was under the command of Captain Alan R. Saint, with co-pilot Vijay Yeshwant Korgaokar, three navigators and a radio operator. At 9:43 a.m., Malabar Princess crashed into the Rochers de la Tournette (Tournette Spur) on the west side of Mont Blanc at an approximate elevation of 15,344 feet (4,677 meters). All 48 persons on board were killed. Air India International was the national airline of India, having been formed from Tata Airlines. On 8 June 1948, Air India’s first scheduled flight departed Bombay for Cairo, Geneva and London. The airliner was Malabar Princess. On 24 January 1966, Air India Flight 101, a Boeing 707-437, VT-DMN, named Kanchenjunga,¹ crashed at almost the same location on Mount Blanc. All 117 persons on board were killed. 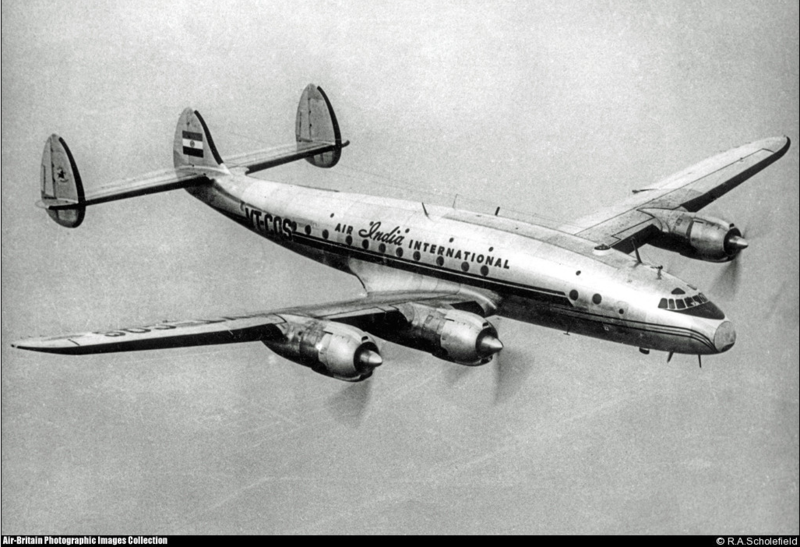 The Lockheed L-749A Constellation was operated by a flight crew of four, with two to four flight attendants. It could carry up to 81 passengers. The airplane was 97 feet, 4 inches (29.667 meters) long with a wingspan of 123 feet (37.490 meters) and an overall height of 22 feet, 5 inches (6.833 meters). It had an empty weight of 56,590 pounds (25,669 kilograms) and maximum takeoff weight of 107,000 pounds (48,534 kilograms). 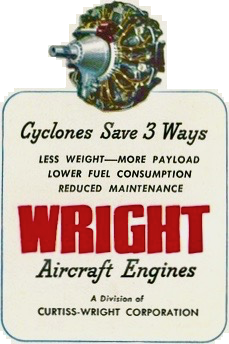 The L-749A was powered by four air-cooled, supercharged and fuel-injected 3,347.66-cubic-inch-displacement (54.858 liter) Wright Aeronautical Division Cyclone 18 (also known as the Duplex-Cyclone) 749C18BD1 two-row 18-cylinder radial engines with a compression ratio of 6.5:1. They had a Normal Power rating of 2,100 horsepower at 2,400 r.p.m., and Takeoff Power rating 2,500 horsepower at 2,800 r.p.m. (five minute limit). The engines drove three-bladed Curtiss-Electric propellers through a 0.4375:1 gear reduction. This engine featured “jet stacks” which converted the piston engines’ exhaust to usable jet thrust, adding about 15 miles per hour (24 kilometers per hour) to the airplane’s speed. The 749C18BD1 was 6 feet, 6.52 inches (1.994 meters) long, 4 feet, 7.62 inches (1.413 meters) in diameter, and weighed 2,915 pounds (1,322 kilograms). The L-749 had a cruise speed of 345 miles per hour (555 kilometers per hour) and a range of 4,995 miles (8,039 kilometers). Its service ceiling was 24,100 feet (7,346 meters). 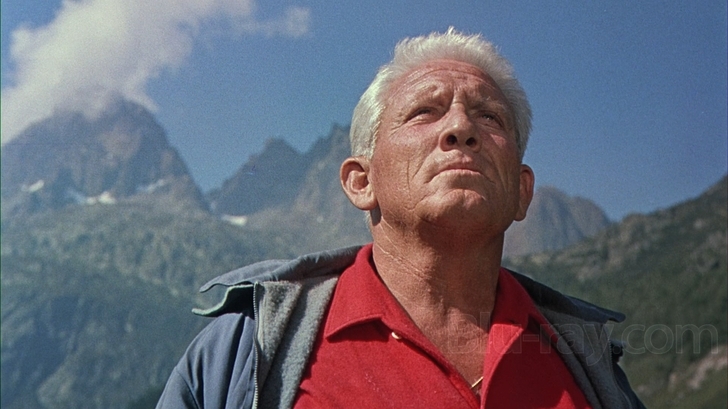 The Air India Flight 245 crash was the basis for a novel, La neige en deuil (“The Snow in Mourning”), written by Henri Troyat (née Lev Aslanovic Tarassov), which in turn inspired the 1956 Edward Dymtryk motion picture, “The Mountain.” The film starred Spencer Tracy, Robert Wagner and Anna Kashfi.² Tracy was nominated by the British Academy of Film and Television Arts for an award for his performance. ¹ Kanchenjunga is the name of the world’s third highest mountain, an “eight thousander” located 125 kilometers (78 miles) east-southeast of Mount Everest in the Himalayas. Its summit is 8,598 meters (28,209 feet) above Sea Level. It is considered to be a sacred mountain. Climbers are not allowed there. ² Anna Kashfi (née Joan O’Callaghan) was the first Mrs. Marlon Brando.